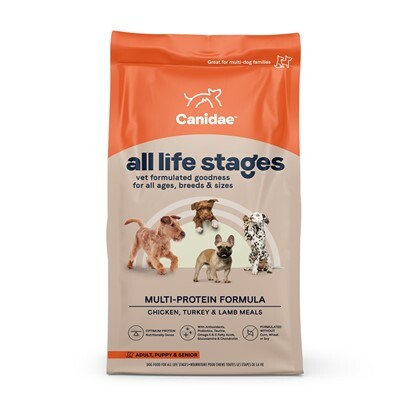 Canidae All Life Stages Formula Dry Dog Food is an all natural dog formula, designed for dogs of all ages, and lifestyles. Made with USDA approved meat, and a balanced nutritious mix of fruits and vegetables, your dog will love Canidae All Life Stages Formula Dry Dog Food. Reviewers say their dogs' "coats are very shiny, and soft, due to the high quality ingredients, designed for maximum benefit for all your dogs. Chicken meal, turkey meal, lamb meal, brown rice, white rice, rice bran, peas, potatoes, oatmeal, cracked pearled barley, chicken fat (preserved with mixed tocopherols), millet, tomato pomace, natural flavor, flaxseed meal, ocean fish meal, choline chloride, suncured alfalfa meal, inulin (from chicory root), lecithin, sage extract, cranberries, beta-carotene, rosemary extract, sunflower oil, yucca schidigera extract, dried enterococcus faecium fermentation product, dried lactobacillus acidophilus fermentation product, dried lactobacillus casei fermentation product, dried lactobacillus plantarum fermentation product, dried trichoderma longibrachiatum fermentation extract, vitamin E supplement, iron proteinate, zinc proteinate, copper proteinate, ferrous sulfate, zinc sulfate, copper sulfate, potassium iodide, thiamine mononitrate, manganese proteinate, manganous oxide, ascorbic acid, vitamin A supplement, biotin, calcium pantothenate, manganese sulfate, sodium selenite, pyridoxine hydrochloride (vitamin B6), vitamin B12 supplement, riboflavin, vitamin D3 supplement, folic acid, papaya, pineapple. *Feed Pregnant Dogs up to 50% more during the last 3 weeks of pregnancy. *During Lactation and Puppies up to six months old, require twice the amount of food as an adult dog and they should be fed 3 to 4 times a day. Puppies, six months to a year, twice daily. *Senior and Overweight Dogs may be fed a reduced amount, depending on the dog's weight and activity level.